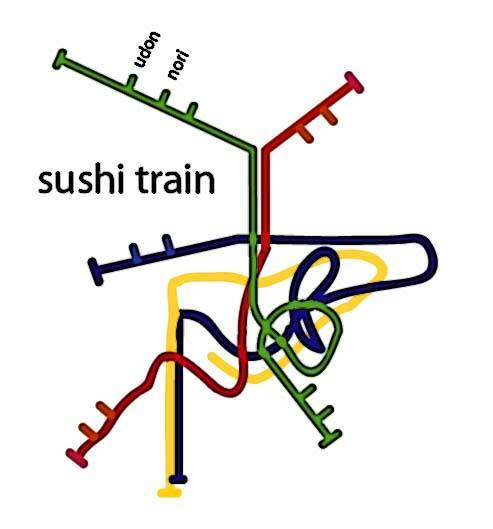 While it is no London Underground, Paris Metro or Sydney CityRail, I’ve discovered that the sushi train has complexities entirely its own. Across the road from my new place of work is a sushi train. Until recently, I’d been a stranger to this culinary piece of infrastructure, and boy was it a bumpy ride. I learned the hard way – I thought I’d share my experiences with those sushi train virgins amongst you. For the more seasoned travelers reading this, please indulge me. At my first ever lunchtime trip to the sushi train, I bowed and followed the waiter down to the place for take away. I picked up my plastic container, soy sachet and wasabi, mesmerised by the conga-line of Japanese treats shuffling along like a bunch of commuters on the Shinkasen. 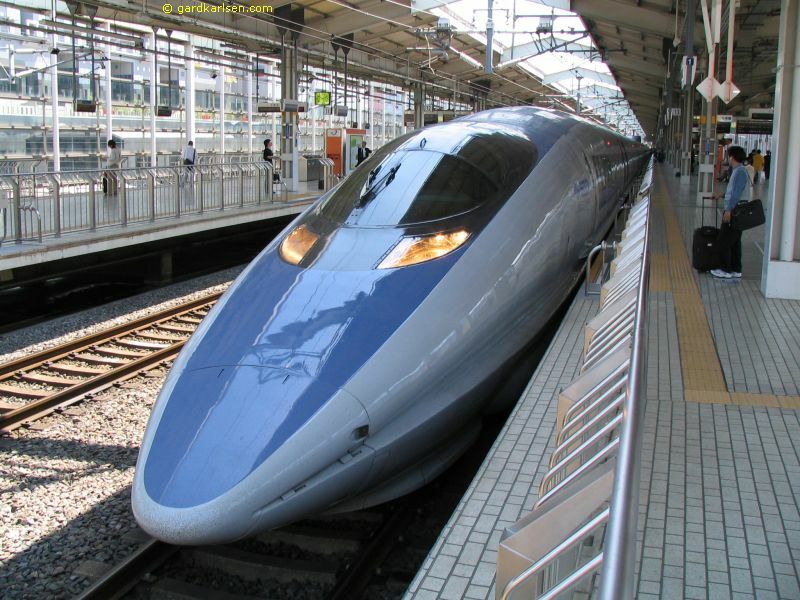 All they needed were some tunnels, signals, Mt Fuji and a stationmaster (toot! toot! chugga chugga chugga chugga toot toot!). I digress. So, after getting the general gist of what was on offer, I started selecting dishes from the plates. “One of those.” “One of that.” “Hmm what’s that?” I picked up one california roll from a plate, put it back on the train. When I presented to the counter with my selection of about 10 different individuals items, the staff were a little concerned. One of the waiters started running around the train picking out different plates. I asked the guy at the counter what the problem was and he explained that I had to take everything from the plate, not just one. So, if I wanted the Nori roll and there were two on the plate, I had to take BOTH of the Nori rolls, not just the one and put the other one back. Aaaaah! Hmm I had about 8 plates I’d done that to. So, the waiter dude running around the train was looking for the 8 plates I made a selection from. It’s by the plate not by the piece. Got it. The second time, I entered confident with the knowledge of what to do and how it all operated. As the sushi train choo-chooed around I noticed the menu and thought it would be a smart idea to do a little bit of research beforehand this time. The menu was filled with amazing pictures of the dishes but alas no price! My previous meal there had cost a little more than I anticipated given I ended up with 8 different plates (enough to feed 3 people), so I wanted to be discerning. Looking further down the menu, I noticed 4 coloured circles with prices next to them. I looked up at the plates. Back at the menu. Back to the plates. Aha! The colour of the plates correlate to the circles! So, this is how I know their price! By my third visit, it was old-hat! At least I thought so. I did my thing, got whole plates into my container, matched the prices with the plate colour. I’m a professional. Off to the counter I go. But why was there a waiter again running around the sushi train? I asked the guy at the counter what the problem was and he explained that you can’t put the empty plate back on the train line – that’s how they work out the cost of your dish. Aaaah! So, the waiter was chasing around for my empty carriages. So, there are some tips. Quite possibly when I next go, I will have more to report on. For the first time perhaps, I felt like an American in a foreign country. It was interesting because rather than explaining to me what the problem was, they adjusted it themselves – polite but not enabling. I really had to go and ask the questions about what was going on. The double-edge of Japanese politeness or the usual experience of a stranger in a new land?